Here at Service Objects, we love data almost as much as we love our dogs. Few things make us happier than exploring or talking about data. Turns out, we’re not the only ones obsessed with data. Check out the following data buzzwords and join the conversation. Business intelligence and data quality software help you make sense of data. Now that’s smart! Data warehousing combines data from multiple, usually varied, sources into one comprehensive and easily manipulated database. For example, Service Objects’ data quality services tap into our massive database which pulls data from various sources such as the US Postal Service, telephone databases, and GPS mapping databases to validate, standardize, and enhance data. In other words, dark data is data that’s not being used. It’s often kept solely for compliance purposes. What if you could enhance that data and put it to good use? Using data quality software, for example, you could validate older, potentially obsolete, addresses and create a direct marketing campaign targeting former customers. With over 23,000 mentions in the last month, “big analytics” is definitely buzzworthy. Big data analytics is the process of examining large data sets containing a variety of data types — i.e., big data — to uncover hidden patterns, unknown correlations, market trends, customer preferences and other useful business information. Big analytics goes hand-in-hand with big data. When big analytics and data quality services work together, your data becomes much smarter and easier to work with. We saved the biggest buzzword for last: “The Internet of Things. Also commonly referred to as “IoT,” the Internet of Things refers to a dramatically more connected Internet. Remember when the only things connected to the Internet were computers and servers? How quaint is that? Look around your personal space. You may have a desktop scanner that scans documents directly to Dropbox or Evernote. Maybe you’re wearing a Fitbit, which transmits your fitness and health stats directly to Fitbit.com. You may even have Internet-connected light bulbs or video surveillance system. If you’re really fancy, your refrigerator connects, tracking UPC codes and notifying you when your milk is about to go sour. On a larger scale, industrial equipment, parking meters, weather stations, and more are connected. How many mentions did it get in the last 30 days? Over 150,000 for “Internet of Things” and another 74,000 for “IoT.” Now that’s trending! 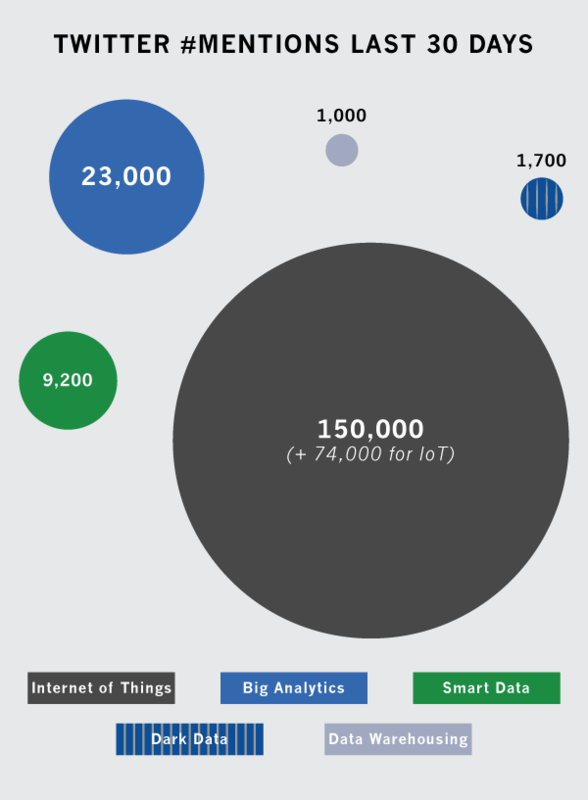 As you can imagine, all those IoT “things” are generating data, contributing to big data. Each of these data buzzwords is interrelated and reflects the need for solutions such as data quality services and analytics.